The Town of Blacksburg continues the 2018 Market Square Jam with host band Eight Point Star String Band on Wednesday, August 22, 2018 at Market Square Park in downtown Blacksburg, VA. Catering to traditional old time music, the Market Square Jam brings regional musicians together to pick a tune, enjoy fun times with their friends and family, and take in all that downtown Blacksburg has to offer. Eight Point Star is the newest musical incarnation of Mike Gangloff, Cara Gangloff and Matt Peyton, created to solidify and expand music that Mike and Cara and Mike and Matt have performed as they toured across Europe and around the southeastern United States. With hardanger fiddle, hurdy-gurdy, banjos, gongs, singing bowls and lots more, this is a mostly acoustic sound, but with Matt's theremin and other electronics occasionally rising to the surface sometimes from the Golden Age jazz or Great American Songbook classics that Cara grew up singing, sometimes from the urgent, raw blues that Matt has pursued and sometimes from pure, free improvisation aimed at creating an in-the-moment symphony. This is extended Appalachian music with a story of its own to tell. Solid, bluesy fingerstyle guitar and soaring, scratchy hardanger fiddle combine for duo explorations; a search for beauty. This Market Square Jam is also part of the 2018 Mountains of Music Homecoming. Market Square Jams are led by a host band. Host bands are just what they seem, a group of musicians committed to leading the jam on a particular evening. Host bands are given a stipend of $175 and are welcome to take additional donations from the crowd. The key is hospitality. In partnership with the town, the host band is responsible for creating a welcoming and inviting atmosphere for all participants and attendees. Hosts are encouraged to interact with the crowd and share stories that would further awareness of this long-standing tradition. 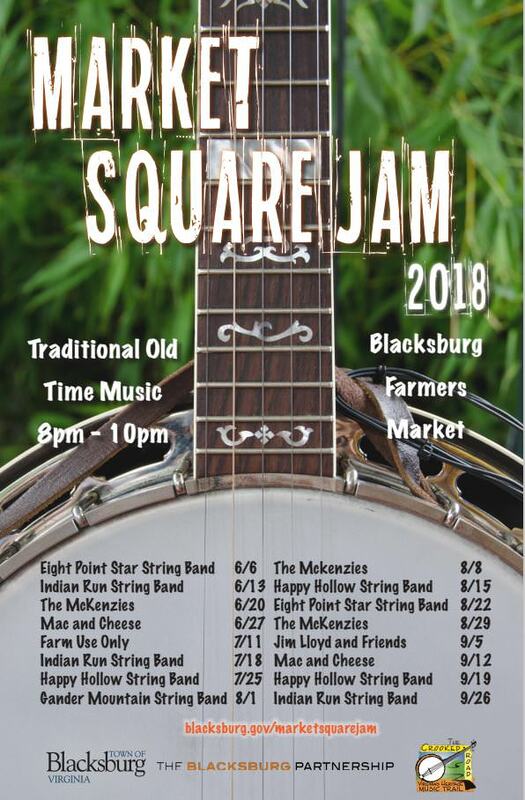 Blacksburg’s Market Square Jam is an official Crooked Road affiliated venue that provides fun and entertainment on Wednesday evenings from 8:00-10:00 pm, June through September. If you’re a musician or just interested in learning, come on out to the Jam and play with the best. Or, if you’re just looking for a place to kick back on a Wednesday night, bring a chair or a blanket and join us at the park. Note: Minimal bench seating is available in the park. Musicians and attendees are encouraged to bring chairs. In the event of minor inclement weather, the Market Square Jam will go on as usual. However, should the weather be significantly disruptive, the host band may decide whether or not they wish to host that evening. Musicians are always welcome to play under the shelter and are encouraged to come out and jam, even in the absence of a host. To view the event flyer, visit: https://i.imgur.com/667HBTM.jpg. For more information, visit: http://www.blacksburg.gov/departments/departments-a-k/community-relations/market-square-jam.